Wolf Commercial Real Estate, a leading South Jersey commercial real estate brokerage firm that concentrates on Southern New Jersey commercial real estate listings and services, now has available prime South Jersey land for sale at White Horse Pike and Pine Street Berlin NJ. This Berlin NJ land for sale is a development site for commercial use. There is about 32.17 acres of commercial land for sale in South Jersey at this South Jersey land site for sale. This Southern New Jersey land for sale at White Horse Pike and Pine Street Berlin NJ comes in three parcels: 8.33 acres, 7.74 acres and 15.93 acres. The asking price for this commercial land for sale in Berlin NJ is $965,000, or $30,000 an acre. This South Jersey land site for sale is being offered for sale by Wolf Commercial Real Estate, a South Jersey commercial real estate broker with expertise in Berlin commercial real estate listings and services. 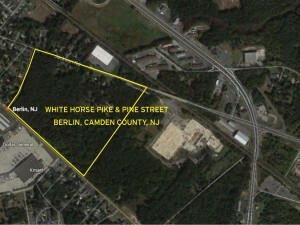 This Southern New Jersey land for sale at White Horse Pike and Pine Street Berlin NJ is ideal for retail and office use. This commercial land for sale in South Jersey is zoned Neighborhood Commercial. This South Jersey land site for sale is located at Block 1502, Lots 1, 2 and 3. This Berlin NJ land for sale is across the street from Dollar Tree and Bank of America. 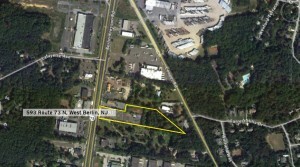 This commercial land for sale in Berlin NJ is within close proximity to the Berlin Shopping Center. About 20,000 cars per day — Annual Average Daily Traffic (AADT) — pass by the intersection of White Horse Pike and Pine Street near the entrance to this Southern New Jersey land for sale. This commercial land for sale in South Jersey at White Horse Pike and Pine Street Berlin NJ has excellent frontage on Route 30. This Berlin NJ land for sale can be purchased through Wolf Commercial Real Estate, a South Jersey commercial real estate brokerage firm that concentrates on Southern New Jersey commercial real estate listings and Berlin commercial real estate listings. Nearly 97,000 residents live within five miles of this commercial land for sale in Berlin NJ. The median household income of those living in the same area of this South Jersey land site for sale is $69,500. For details on this South Jersey land for sale at White Horse Pike and Pine Street Berlin NJ, about commercial land for sale in South Jersey or about any other South Jersey commercial properties for sale or lease, please call or email or Jason Wolf (856-857-6301; jason.wolf@wolfcre.com) at Wolf Commercial Real Estate, a South Jersey commercial real estate broker that specializes in Berlin commercial real estate listings and services. Wolf Commercial Real Estate is a leading South Jersey commercial real estate broker that offers an array of Southern New Jersey commercial real estate listings and services, marketing commercial offices, medical properties, industrial properties, land properties, retail buildings and other South Jersey commercial properties for buyers, tenants, investors and sellers. Please visit our websites for a full listing of South Jersey commercial properties for lease or sale through our South Jersey commercial real estate brokerage firm. Wolf Commercial Real Estate, a top South Jersey commercial real estate brokerage firm that specializes in Southern New Jersey commercial real estate listings and services, now has available prime South Jersey land for sale at 6 Park Drive Berlin NJ. This Berlin NJ land for sale is a prime commercial development site. There is approximately 1.29 acres of commercial land for sale in South Jersey at this South Jersey land site for sale. This Southern New Jersey land for sale at 6 Park Drive Berlin NJ is fully approved for a two-story building. The asking price for this commercial land for sale in Berlin NJ is $225,000. This South Jersey land site for sale is being offered for immediate sale by Wolf Commercial Real Estate, a South Jersey commercial real estate broker with expertise in Berlin commercial real estate listings and services. This Southern New Jersey land for sale at 6 Park Drive Berlin NJ is ideal for a variety of uses, including office, medical, professional and retail development. This commercial land for sale in South Jersey is zoned C-2 (Neighborhood Commercial). This South Jersey land site for sale is located at Block 307, Lot 7 & 9. 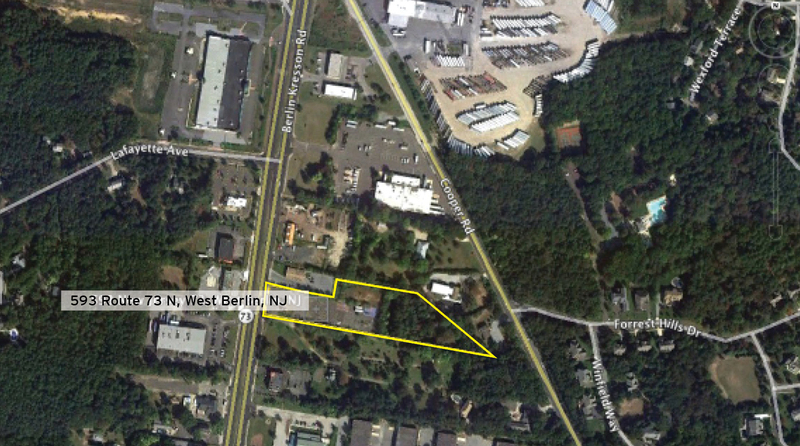 Situated at a signalized corner, this Berlin NJ land for sale is across the street from Berlin Community Park. This commercial land for sale in Berlin NJ is within close proximity to Routes 30 & 73. Approximately 23,000 vehicles per day — Annual Average Daily Traffic (AADT) — pass by the intersection of Berlin-Cross Keys Road & Park Drive near the entrance to this Southern New Jersey land for sale. This commercial land for sale in South Jersey at 6 Park Drive Berlin NJ is just minutes from Virtua Voorhees and many other amenities. This Berlin NJ land for sale is now available through Wolf Commercial Real Estate, a South Jersey commercial real estate brokerage firm that specializes in Southern New Jersey commercial real estate listings as well as Berlin commercial real estate listings. Nearly 130,000 residents live within five miles of this commercial land for sale in Berlin NJ. The median household income of those living in the same area of this South Jersey land site for sale is $66,700. For more information about this South Jersey land for sale at 6 Park Drive Berlin NJ, about commercial land for sale in South Jersey or about any other South Jersey commercial properties for sale or lease, please contact or Jason Wolf (856-857-6301; jason.wolf@wolfcre.com) at Wolf Commercial Real Estate, a South Jersey commercial real estate broker that is experienced in Berlin commercial real estate listings and services. Wolf Commercial Real Estate is a leading South Jersey commercial real estate broker that provides a full range of Southern New Jersey commercial real estate listings and services, marketing commercial offices, medical properties, industrial properties, land properties, retail buildings and other South Jersey commercial properties for buyers, tenants, investors and sellers. Please visit our websites for a full listing of South Jersey commercial properties for lease or sale through our South Jersey commercial real estate brokerage firm. Wolf Commercial Real Estate, a premier Southern New Jersey commercial real estate broker that specializes in South Jersey commercial real estate listings and services, is now offering well-located South Jersey land for sale at 1223 Haddonfield Berlin Road Voorhees NJ. This Voorhees NJ land for sale is a prime development site. There are plus or minus 8.12 acres of Voorhees NJ land for sale at this South Jersey land site for sale. This Southern New Jersey land for sale is located at Block 263, Lots 11-15. The asking price for this land for sale in South Jersey at 1223 Haddonfield Berlin Road Voorhees NJ is $1,195,000 ($147,167/acre). This South Jersey land site for sale is available through Wolf Commercial Real Estate, a Southern New Jersey commercial real estate brokerage firm that specializes in South Jersey commercial real estate listings and services. This well-located South Jersey land for sale at 1223 Haddonfield Berlin Road Voorhees NJ is rated B – Business. 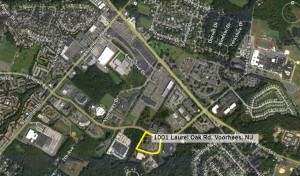 This Voorhees NJ land for sale is ideal for a medical/professional, single-story office development. This Southern New Jersey land for sale is in close proximity to Virtua Health System, Voorhees Towne Center and many other retail and regional health facilities. Located on the well-traveled Haddonfield Berlin (Route 561) corridor, this land for sale in South Jersey provides easy access to Route 73 and 1-295. This South Jersey land site for sale is now available through Wolf Commercial Real Estate, a premiere Southern New Jersey commercial real estate broker that specializes in South Jersey commercial real estate listings and services. More than 167,000 people live within a five-mile radius of this Southern New Jersey land for sale. The median household income of those living within five miles of this land for sale in South Jersey is $70,939. For more information about this South Jersey land for sale at 1223 Haddonfield Berlin Road Voorhees NJ or about any other South Jersey commercial properties for sale or lease, please contact Jason Wolf (856-857-6301; jason.wolf@wolfcre.com) at Wolf Commercial Real Estate, a leading Southern New Jersey commercial real estate brokerage firm. Wolf Commercial Real Estate is a Southern New Jersey commercial real estate broker that provides a full range of South Jersey commercial real estate listings and services, marketing commercial offices, medical properties, industrial properties, land properties, retail buildings and other South Jersey commercial properties for buyers, tenants, investors and sellers. Please visit our websites for a full listing of South Jersey commercial properties for lease or sale through our Southern New Jersey commercial real estate brokerage firm. April 7, 2014 – Marlton, NJ – The second snowiest winter on record couldn’t stop the enthusiasm in the regional commercial real estate markets, according to the latest quarterly report by Wolf Commercial Real Estate (WCRE). Driven by job gains and growth in some industries, the region bounced back from the slight slow-down of the fourth quarter, posting a 26 percent increase in square feet leased compared with the first quarter of last year. Even with historic severe weather, the CRE market was very busy during first quarter, with further stabilization of rents, the consummation of a mega-deal for a 24-building office/flex portfolio, and another large group of assets coming onto the market. There were approximately 397,141 square feet of new leases and renewals executed in the three counties surveyed. Notably, expansions and new deals remained strong this quarter, representing 54 percent of all transactions. Net absorption for the quarter was approximately 123,746 sf, a 20-point increase over the fourth quarter of 2013. The report noted that many of the quarter’s subject properties were located in prime 3M locations within Burlington County, and that the tightening of those areas was causing demand to shift toward large vacancies in Camden County. The two most noteworthy developments in the quarterly report were the closing of Liberty Property Trust’s (NYSE: LRY) disposition of its entire office/flex portfolio in the region, and Brandywine Realty Trust’s (NYSE: BDN) listing a portion of its area portfolio for sale. The Liberty Property Trust portfolio, comprising 1,188,285 square feet in 24 buildings, was purchased by Somerset Properties. Brandywine has listed five office buildings totaling 397,000 square feet. — Burlington County continued to maintain a significantly lower vacancy rate than Camden County, at 9.6 percent compared with Camden’s 19.3 percent, though both counties saw decreases of more than a point this quarter. — Average rents for Class A & B product continue to show strong support in the range of $11.00-$14.00/sf NNN or $21.00-$24.00/sf gross, with an overall market average showing strong support in the $11.00-$11.50/sf NNN or $21.00-$21.50/sf gross for the deals completed during the first quarter. This is essentially unchanged from the previous quarter. — New lease activity for Q1 is in the range of approximately 215,910 square feet of new deals and/or expansions and approximately 181,231 square feet of renewals, for a total of approximately 397,141 square feet of leasing activity. — All of the major private owners and REITS showed a significant increase in prospect activity for the quarter, and are all cautiously optimistic for 2014. — Businesses that specialize in banking, consulting, government, information technology and financial services all were very active in Southern New Jersey during the first quarter. — Overall retail vacancy in the tri-county area is hovering around 15.2%, up several points from a fourth quarter marked by disappointing retail sales figures. — Class A retail product rental rates continue to show strong support in the range of $30.00-$40.00/sf NNN, which is essentially unchanged from the previous several quarters. — Class B product shows support in the range of $15.00-$25.00/sf NNN. The full report is available upon request. WCRE is a full-service commercial real estate brokerage and advisory firm specializing in office, retail, medical, industrial and investment properties in Southern New Jersey and the Philadelphia region. We provide a complete range of real estate services to commercial property owners, companies, banks, commercial loan servicers, and investors seeking the highest quality of service, proven expertise, and a total commitment to client-focused relationships. Through our intensive focus on our clients’ business goals, our commitment to the community, and our highly personal approach to client service, WCRE is creating a new culture and a higher standard. We go well beyond helping with property transactions and serve as a strategic partner invested in your long term growth and success. Learn more about WCRE online at www.wolfcre.com, on Twitter @WCRE1, and on Facebook at Wolf Commercial Real Estate, LLC. Visit our blog pages at www.southjerseyofficespace.com, www.southjerseyretailspace.com, and www.southjerseymedicalspace.com. Wolf Commercial Real Estate, a leading South Jersey commercial real estate broker that specializes in South Jersey commercial real estate listings and services, is now offering a prime South Jersey land site for sale at 1721 Springdale Road Cherry Hill NJ. This South Jersey land for sale is located on Springdale Road in the highly desirable east side of Cherry Hill. The property at this South Jersey land parcel for sale is a prime development site that currently holds Bethel Baptist Church’s Shining Lights Early Learning Center, a newly renovated 21,325 square-foot school building with a gym, stage, full kitchen and abundant parking. There are approximately 18 acres of developable South Jersey commercial land for sale at 1721 Springdale Road Cherry Hill NJ. The asking price for this land for sale in South Jersey is $4,250,000. This South Jersey land site for sale at 1721 Springdale Road Cherry Hill NJ will be available for occupancy or development at the end of the 2013-2014 school year. Wolf Commercial Real Estate, a South Jersey commercial real estate brokerage firm that specializes in South Jersey commercial real estate listings and services, has been appointed exclusive sales agent by Bethel Baptist Church to market this land for sale in South Jersey. Proceeds from the sale of this South Jersey land for sale will be used to fund construction of a new state-of-the-art daycare facility for Shining Lights Early Learning Center and an 8,000 square-foot expansion to the church at its primary property across Springdale Road. This unique South Jersey commercial land for sale through Wolf Commercial Real Estate, a South Jersey commercial real estate broker, is a fabulous opportunity for redevelopment as another school, healthcare facility, senior care or a variety of institutional uses. This highly visibly South Jersey land parcel for sale provides convenient access to Route 70, I-295 and the New Jersey Turnpike. This South Jersey land site for sale at 1721 Springdale Road Cherry Hill NJ also is located just minutes from shopping, restaurants and many other amenities. Nearly 309,000 people live within a five-mile of this prominent South Jersey commercial land for sale through Wolf Commercial Real radius Estate, a South Jersey commercial real estate brokerage firm that specializes in South Jersey commercial real estate listings and services. The median household income for people living within one mile of this South Jersey land for sale is $90,021. The median household income for people living within a three mile radius of this land for sale in South Jersey is $77,353. A marketing brochure and property highlight materials are available upon request from Wolf Commercial Real Estate, the South Jersey commercial real estate broker that has been exclusively retained to market this South Jersey land parcel for sale. For more information about this South Jersey commercial land for sale at 1721 Springdale Road Cherry Hill NJ or about any other South Jersey commercial properties for lease or sale, please contact Jason Wolf (856-857-6301; jason.wolf@wolfcre.com), or Scott Seligman (856-857-6305; scott.seligman@wolfcre.com) at Wolf Commercial Real Estate, the foremost South Jersey commercial real estate brokerage firm. Wolf Commercial Real Estate is a premier South Jersey commercial real estate broker that provides a full range of South Jersey commercial real estate listings and services, marketing commercial offices, medical properties, industrial properties, land properties, retail buildings and other South Jersey commercial properties for buyers, tenants, investors and sellers. Please visit our websites for a full listing of South Jersey commercial properties for lease or sale through our South Jersey commercial real estate brokerage firm. Wolf Commercial Real Estate, a leading South Jersey commercial real estate broker that specializes in South Jersey commercial real estate listings and services, is offering a premier parcel of Delran NJ commercial land for sale at 7023 Route 130 South Delran NJ. This well located South Jersey land site for sale is approximately 8.41 acres of highly visible vacant land in Delran NJ. This South Jersey land for sale is located at the jug handle of Route 130 South and Fairview Avenue, providing maximum exposure to traffic traveling on both roadways. 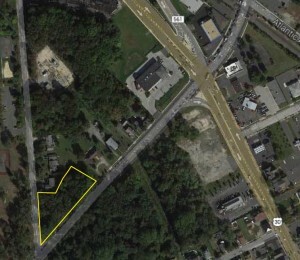 With 343 feet of premier frontage along heavily traveled Route 130, this Delran NJ land site for sale at 7023 Route 130 South Delran NJ is an excellent development opportunity that is available though Wolf Commercial Real Estate, a South Jersey commercial real estate broker that specializes in Delran commercial real estate listings and services. This Delran NJ land for sale is in an area that has been transformed into a busy retail destination. This vacant land in Delran NJ is adjacent to a Walgreens pharmacy. Other businesses near this South Jersey land site for sale include Home Depot, Lowe’s, Staples, Chick-fil-A, Saladworks, Mattress Giant, Shop Rite, Home Goods, Pizza Hut, Chili’s, Barlow Chevrolet, Red Lobster, CVS, Target, Petsmart, Hair Cuttery, Party City and more. The asking price for this prime South Jersey land for sale at 7023 Route 130 South Delran NJ is $1.95 million, or $231,866 per acre. This Delran NJ commercial land for sale is available for immediate possession through Wolf Commercial Real Estate, a leading South Jersey commercial real estate brokerage firm that specializes in Delran commercial real estate listings and services. Nearly 223,622 people live within a five-mile radius of this well positioned South Jersey commercial land for sale. The median household income of those living within a five-mile radius of this Delran NJ land for sale is $61,036. This Delran NJ land site for sale at 7023 Route 130 South DelranNJ has a small building on the property near the Fairview Street access. This 8.41-acres of vacant land in Delran NJ is otherwise unimproved and is available for development. This South Jersey land for sale is now being offered by Wolf Commercial Real Estate, a leading South Jersey commercial real estate broker that specializes in South Jersey commercial real estate listings and services. With its position on Route 130, this Delran NJ land site for sale is in close proximity to Philadelphia and has easy access to I-295, the New Jersey Turnpike and Route 73. This South Jersey commercial land for sale is ideal for development of virtually any retail or office development. Jason Wolf and Leor Hemo of Wolf Commercial Real Estate, the foremost South Jersey commercial real estate brokerage firm that specializes in South Jersey commercial real estate listings and services, were retained to market this premier Delran NJ land for sale. For more information about this South Jersey land site for sale at 7023 Route 130 South Delran NJ, about other South Jersey commercial land for sale, or about any other South Jersey commercial properties for sale or lease, please contact Jason Wolf (856-857-6301; jason.wolf@wolfcre.com) at Wolf Commercial Real Estate, a leading South Jersey commercial real estate broker that specializes in Delran commercial real estate listings and services. Wolf Commercial Real Estate is a leading South Jersey commercial real estate brokerage firm that provides a full range of South Jersey commercial real estate listings and services, marketing commercial offices, medical properties, industrial properties, land properties, retail buildings and other South Jersey commercial properties for buyers, tenants, investors and sellers. Please visit our websites for a full listing of South Jersey commercial properties for lease or sale through our South Jersey commercial real estate brokerage firm. The Southern New Jersey commercial real estate market continues to emerge solidly from the havoc caused by the Great Recession, but significant South Jersey office space vacancies and the possibility of rising interest rates may provide challenges for the future of the Southern New Jersey commercial real estate market, according to a new quarterly market analysis issued by Wolf Commercial Real Estate (WCRE), a leading Southern New Jersey commercial real estate brokerage firm that specializes in South Jersey commercial land for sale and other South Jersey commercial real estate services. Approximately 540,000 square feet of new lease deals and renewals for Southern New Jersey commercial real estate, including South Jersey land sites, were executed during the second quarter, and about 35 percent, or some 185,000 square feet of the total, comprised new deals, according to WCRE’s quarterly Southern New Jersey Office and Retail Market Update, which is now in its second year. The jump in activity in Southern New Jersey commercial land, office space and retail space was one of several positive developments noted in the report. The report on South Jersey commercial real estate activity notes that the stock market closed Q2 up 12 percent on the year – its best first half of a year since 1999 – and that unemployment rates both in New Jersey and nationwide continue to fall, while rental rates for South Jersey office space have stabilized and continue to rise, and Southern New Jersey retail space rental rates were rising for the first time in five years. Still, according to WCRE, vacancy rates in the office market for Class A and B product remain in the range of 18-19 percent. Amid all the good news for the South Jersey commercial real estate market, the report finds a possible indicator that inflation may be on the horizon, noting the sharp rise in the 10-Year Treasury yield through May and June and the effect that could have on interest rates in the Southern New Jersey commercial real estate market, including Southern New Jersey commercial land for sale. “If interest rates go up, our borrowing costs go up, which will have an effect on pricing and cap rates,” according to the report from Wolf Commercial Real Estate, a Southern New Jersey commercial real estate broker that specializes in South Jersey commercial land for sale and other South Jersey commercial real estate listings. WCRE’s research includes snapshots of the Southern New Jersey office space and retail space markets and details on the major deals being consummated or planned in the Southern New Jersey commercial real estate market. — Positive absorption for the second quarter was in the range of 185,000+/-sf of new deals and/or expansions in South Jersey commercial real estate. This is a 20 percent increase over the second quarter of 2012, and an astonishing 80 percent gain over the first quarter of this year. — Average rents for Class A & B product remained at or above the improved level they reached last year, continuing to show strong support in the range of $10-$14.00/sf NNN with an overall market average of $11.00/sf NNN for deals completed during the quarter for Southern New Jersey office space. — Healthcare, computer services, insurance, defense contracting, consulting, engineering, and finance companies all were very active in the South Jersey office space market during the second quarter. — Retail landlords are experiencing increased rental rates for Southern New Jersey retail space for the first time since 2008. — Overall South Jersey retail space vacancy has fallen to 15% and the Southern New Jersey retail space market has stabilized. Community and lifestyle shopping centers have much less vacancy than neighborhood and strip shopping centers. — Average rents for upscale lifestyle centers in the Southern New Jersey retail space market continue to show strong support in the range of $30-$40.00/sf NNN, and average rents for neighborhood and strip shopping centers remain in the range of $15-$23/sf NNN. The full report, including details about several key deals, is available upon request from Wolf Commercial Real Estate, a South Jersey commercial real estate brokerage firm that specializes in commercial real estate listings for Southern New Jersey land sites for sale, office space and retail space. For more information about South Jersey land sites for sale, South Jersey office space, South Jersey retail space, or about any other Southern New Jersey commercial real estate listings, please contact Jason Wolf (856-857-6301; jason.wolf@wolfcre.com),, Christina Del Duca (856-857-6304; christina.delduca@wolfcre.com) or Scott Seligman (856-857-6305; scott.seligman@wolfcre.com) at Wolf Commercial Real Estate, a leading Southern New Jersey commercial real estate broker. As real estate brokerage and advisory experts that specialize in South Jersey commercial land for sale and other Southern New Jersey commercial real estate services, the team at our South Jersey commercial real estate brokerage firm provides ongoing detailed information to our clients and prospects to help them achieve their real estate goals. At WCRE, our South Jersey commercial real estate services encompass the highest quality of service, proven expertise, and a total commitment to client-focused relationships. Learn more about WCRE, a Southern New Jersey commercial real estate brokerage firm that specializes in South Jersey land sites for sale and other Southern New Jersey commercial real estate listings, online at www.wolfcre.com, on Twitter @WCRE1, LinkedIn and on Facebook at Wolf Commercial Real Estate, LLC. Visit our blog pages at www.southjerseyofficespace.com http://www.southjerseyofficespace.com/, www.southjerseymedicalspace.com http://www.southjerseymedicalspace.com/, www.southjerseyland.com http://www.southjerseyland.com/, www.southjerseyretailspace.com http://www.southjerseyretailspace.com/ and www.southjerseyindustrialspace.com http://www.southjerseyindustrialspace.com/. WCRE is a leading Southern New Jersey commercial real estate broker that provides a full range of Southern New Jersey commercial real estate services, marketing commercial offices, medical properties, industrial properties, land properties and retail buildings for buyers, tenants, investors and sellers. Please visit our websites for information about Southern New Jersey commercial land for sale or lease and other Southern New Jersey commercial real estate services or for information about South Jersey commercial real estate listings for office space, retail space, medical space, industrial space or land for sale or lease from this South Jersey commercial real estate broker. Wolf Commercial Real Estate (WCRE), a leading Southern New Jersey commercial real estate brokerage firm that specializes in West Berlin commercial real estate, is offering a premier South Jersey land site for sale or lease at 593 Route 73 in West Berlin NJ. This highly visible West Berlin NJ land site for sale or lease is a 3.75-acre parcel that is located on Route 73 North. This South Jersey land for sale or lease is in close proximity to Sahara Sam’s, the largest indoor water park in the tri-state area, the new Virtua Hospital, and many other retail businesses and regional medical facilities. More than 43,000 vehicles per day pass by this Southern New Jersey land for sale or lease through Wolf Commercial Real Estate, a South Jersey commercial real estate broker. This well-positioned South Jersey land site for sale or lease offers a great development opportunity for hospitality, health, retail or professional uses. Nearly 138,000 people live within a five-mile radius of this prime Southern New Jersey commercial land for sale or lease and the median household income of those living within a five-mile radius of this commercial land in 08091 is $70,061. This South Jersey commercial land for sale or lease at 593 Route 73 West Berlin NJ is a previously developed site with existing utilities and site work in place. This Southern New Jersey commercial land for sale or lease is zoned for commercial use. Jason Wolf and Leor Hemo of Wolf Commercial Real Estate, a premier Southern New Jersey commercial real estate broker, were retained to market this South Jersey land for sale or lease. More information and marketing brochures are available upon request for this Southern New Jersey land for sale or lease. For more information about this South Jersey commercial land for sale or lease at 593 Route 73 in West Berlin NJ, about other commercial land in 08091, or about any other Southern New Jersey commercial real estate listings, please contact Jason Wolf (856-857-6301; jason.wolf@wolfcre.com) at Wolf Commercial Real Estate, a leading South Jersey commercial real estate brokerage firm. As real estate brokerage and advisory experts in Southern New Jersey that specialize in West Berlin commercial real estate listings, the team at our South Jersey commercial real estate brokerage firm provides ongoing detailed information to our clients and prospects to help them achieve their real estate goals. At WCRE, our South Jersey commercial real estate services encompass the highest quality of service, proven expertise and a total commitment to client-focused relationships. Learn more about WCRE, a Southern New Jersey commercial real estate brokerage firm that specializes in West Berlin commercial real estate listings, online at www.wolfcre.com, on Twitter @WCRE1, LinkedIn and on Facebook at Wolf Commercial Real Estate, LLC. Visit our blog pages at: www.southjerseyofficespace.com <http://www.southjerseyofficespace.com/>, www.southjerseymedicalspace.com <http://www.southjerseymedicalspace.com/>, www.southjerseyland.com <http://www.southjerseyland.com/>, www.southjerseyretailspace.com <http://www.southjerseyretailspace.com/> and www.southjerseyindustrialspace.com <http://www.southjerseyindustrialspace.com/>. WCRE is a leading Southern New Jersey commercial real estate broker that provides a full range of South Jersey commercial real estate services, marketing commercial offices, medical properties, industrial properties, land properties and retail buildings for buyers, tenants, investors and sellers. Please visit our websites for listings of South Jersey commercial land for lease or sale and other Southern New Jersey commercial real estate listings or for information about South Jersey commercial real estate services for office space, retail space, medical space, industrial space or land for sale or lease from this South Jersey commercial real estate broker. The local commercial real estate market continued its steady climb in the first quarter of 2013, free from dramatic headlines about natural disasters and government crises that marked the end of 2012, Wolf Commercial Real Estate said in its latest quarterly analysis of Southern New Jersey commercial real estate. Movement in the federal jobs and housing markets fueled consumer and investor activity locally, helping the market sustain several positive trends. “The Dow Jones reached an all-time high, the federal and New Jersey unemployment rates fell slightly, home values and retail sales increased, and interest rates remained near historic lows,” said Jason Wolf, founder and principal of WCRE. “We saw several positive trends indicating improving growth, but we are still in a weak labor market, and more robust job growth is needed to lower the overall vacancy figures in our region.” Overall vacancy in the office market for Class A and B product is still hovering in the range of 18-19 percent, but the market has stabilized, and average rental rates continue to improve. WCRE’s research into Southern New Jersey commercial real estate includes snapshots of the office and land markets, and details on the major deals being consummated or planned. According to the WCRE office report, there were approximately 300,000 sf in new lease and renewals transactions in the Southern New Jersey commercial real estate market during the first quarter, with new lease transactions comprising almost 43 percent of the transactions. This is only a four percent increase from the first quarter of 2012, but Wolf said that better figures were on the horizon. “There are more than 200,000 sf of new deals and renewals awaiting signature in April alone, so we expect substantial gains in the next quarter,” he said. — Average rents for Class A & B product remained at or above the improved level they reached last year, continuing to show strong support in the range of $10-$14.00/sf NNN with an overall market average of $11.00/sf NNN for the deals completed during the quarter. — Positive absorption for the first quarter was in the range of 130,000+/-sf of new deals and/or expansions. 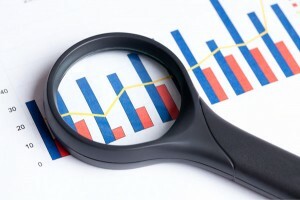 This is a gain of 8.5 percent compared to the first quarter of 2012, which WCRE attributes to pent up demand from last year, reflecting that much of the uncertainty of the fourth quarter is behind us. — Healthcare, computer services, insurance, defense contracting, consulting, engineering, and financial companies all were very active in Southern New Jersey during the first quarter. — Demand for high quality investment properties is high, while supply remains low, intensifying competition for these properties. — Area retailers reported that first quarter sales figures exceeded those from the holiday shopping season of the previous quarter, an excellent sign for the economy. — Overall retail space vacancy is still hovering in the 17-18% range, but the market has stabilized, and community and lifestyle shopping centers have very little vacancy, while neighborhood and strip shopping centers have more vacancy and less growth in rental rates. — Average rents for upscale lifestyle centers continue to show strong support in the range of $30-$40.00/sf NNN, and average rents for neighborhood and strip shopping centers remain in the range of $15-$23/sf NNN. — As with office properties, demand for high quality retail investment properties is outpacing supply, driving prices up further and CAP rates down. The full report, including details about several key deals, is available upon request. WCRE is a full-service commercial real estate brokerage and advisory firm specializing in office, land, industrial and investment properties in Southern New Jersey and the Philadelphia region. We provide a complete range of real estate services to commercial property owners, companies, and investors seeking the highest quality of service, proven expertise, and a total commitment to client-focused relationships. Through our intensive focus on our clients’ business goals, our commitment to the community, and our highly personal approach to client service, WCRE is creating a new culture and a higher standard. We go well beyond helping with property transactions and serve as a strategic partner invested in your long term growth and success. For more information about this South Jersey commercial real estate brokerage firm or about any South Jersey commercial real estate for sale or lease, please contact Jason Wolf (856-857-6301; jason.wolf@wolfcre.com),, Scott Seligman (856-857-6305; scott.seligman@wolfcre.com) or Christina Del Duca (856-857-6304; christina.delduca@wolfcre.com) at Wolf Commercial Real Estate, a leading Southern New Jersey commercial real estate brokerage firm. As real estate brokerage and advisory experts in Southern New Jersey, the team at our South Jersey commercial real estate brokerage firm provides ongoing detailed information to our clients and prospects to help them achieve their real estate goals. At WCRE, our South Jersey commercial real estate services encompass the highest quality of service, proven expertise, and a total commitment to client-focused relationships. Learn more about WCRE, a Southern New Jersey commercial real estate brokerage firm that specializes in South Jersey commercial real estate, online at www.wolfcre.com, on Twitter @WCRE1, LinkedIn and on Facebook at Wolf Commercial Real Estate, LLC. Visit our blog pages at: www.southjerseyofficespace.com<http://www.southjerseyofficespace.com/>, www.southjerseymedicalspace.com<http://www.southjerseymedicalspace.com/>, www.southjerseyland.com<http://www.southjerseyland.com/>, www.southjerseyretailspace.com<http://www.southjerseyretailspace.com/> and www.southjerseyindustrialspace.com<http://www.southjerseyindustrialspace.com/>. WCRE provides a full range of South Jersey commercial real estate services, marketing commercial offices, medical properties, industrial properties, land properties and retail buildings for buyers, tenants, investors and sellers. Please visit our websites for listings of South Jersey land for lease or sale and other South Jersey commercial real estate for sale or lease or for information about South Jersey commercial real estate services for land, retail space, medical space, industrial space or land for sale or lease from this South Jersey commercial real estate brokerage firm. WCRE (Wolf Commercial Real Estate), a South Jersey Commercial Real Estate Brokerage Firm, is offering a prime South Jersey land site for sale or lease at 1001 Laurel Oak Road in Voorhees New Jersey Camden County 08043. This Voorhees NJ land parcel for sale or lease is part of the South Jersey Professional Center, located in the Voorhees Corporate Center. This premier approved Southern New Jersey land site for sale or lease can be purchased with the approved +/-10,000 square foot medical/professional office plans in place and/or the ownership can build to suit based on a buyer’s specific needs. The asking price for the build-out shell of this South Jersey land site is $200.00/sf. For pricing information on the land and approvals only at this Southern New Jersey professional/medical land for sale or lease, please contact WCRE. This well-located South Jersey land for sale or lease offers a great opportunity to any medical or professional practice looking to expand within a prestigious professional park. Other major occupants of the Voorhees Corporate Center include Children’s Hospital of Philadelphia, Flyer’s Skate Zone, AAA of Southern New Jersey, Thomas Jefferson University Hospital, KinderCare, Hampton Inn, and Kellman Brown Academy Day School. Nearly 211,000 people live within a five-mile radius of this Southern New Jersey land parcel for sale or lease and the median household income of those living within a five-mile radius of this Voorhees NJ professional/medical land for sale or lease is $68,599. This Southern New Jersey land for sale or lease at 1001 Laurel Oak Road in Voorhees New Jersey Camden County 08043 is zoned for office use (O-3). More than 22,000 vehicles per day travel on Haddonfield-Berlin Road near this South Jersey land parcel for sale or lease and there is ample parking at 5.50/1,000 sf. WCRE’s Jason Wolf & Leor Hemo were retained to market this prime Southern New Jersey land site for sale or lease. More information and marketing brochures are available upon request. For more information about this South Jersey professional/medical land for sale or lease at 593 Route 73 West Berlin New Jersey Camden County 08091 or about any other South Jersey commercial properties for sale or lease, please contact Jason Wolf (856-857-6301; jason.wolf@wolfcre.com), or Scott Seligman (856-857-6305; scott.seligman@wolfcre.com) at Wolf Commercial Real Estate, the premier Southern New Jersey and Philadelphia region Commercial Real Estate Brokerage and Advisory firm. As real estate brokerage and advisory experts in Southern New Jersey and the Philadelphia region, the team at our New Jersey commercial real estate brokerage firm provides ongoing detailed information to our clients and prospects to help them achieve their real estate goals. Learn more about WCRE, a Southern New Jersey Commercial Real Estate Brokerage Firm, online at www.wolfcre.com, on Twitter @WCRE1, and on Facebook at Wolf Commercial Real Estate, LLC. Visit our blog pages at www.southjerseyofficespace.com<http://www.southjerseyofficespace.com/>, www.southjerseymedicalspace.com<http://www.southjerseymedicalspace.com/>, www.southjerseyland.com<http://www.southjerseyland.com/> and www.southjerseyretailspace.com<http://www.southjerseyretailspace.com/> and www.southjerseyindustrialspace.com<http://www.southjerseyindustrialspace.com/>. WCRE markets Southern New Jersey and Philadelphia commercial offices, medical properties, industrial properties and retail buildings for buyers, tenants, investors and sellers in such areas as Marlton, Moorestown, Mount Laurel, Cherry Hill, Voorhees, and Pennsauken. Please visit our websites for listings of Southern New Jersey professional office space for lease or purchase and other Southern New Jersey commercial real estate for lease or purchase or for information about office space, retail space, medical space, industrial space or land for sale or lease from this Southern New Jersey Commercial Real Estate Broker.